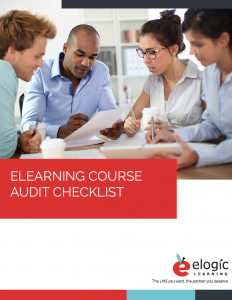 FREE DOWNLOAD: Elearning Course Audit Checklist. Audit your course on factors related to engagement, user experience, course material, and more. Most of the research associated with understanding course completion rates are studying MOOCs (massive open online courses). These are giant, free courses in which thousands of students enroll to learn topics from university professors or professionals whom they would otherwise have no access to. There are hundreds of these kinds of courses available from the best universities (I’ve personally signed up for writing courses from the most prestigious writing program in the country, which is an amazing thing). The MOOC is a revolution in education, supposedly. But when we realize that 90% of enrollees don’t finish the courses, it seems like it’s not working. Researchers have looked into what’s behind these seemingly ridiculous drop-out rates for a voluntary course. What they discovered about these online learners can help us understand learner motivation, which can help us design training strategies even in a different environment (corporate training). After all, only 32% of people start job-related e-learning courses if they’re not required, and if we want to build learning cultures at our companies, we need to understand what will motivate those employees to sign up (and get to the end). Learners sign up for MOOCs because they want to improve their professional skills or learn something new. Often learners find that only part of the course meets their needs for skill growth. Sometimes learners leave a course because they’ve gotten what they needed out of it already. Adult learners only want to engage in material that is useful for them. Adult learners are usually busy professionals to whom time is a valuable asset. They’re less concerned with collecting certificates of completion then bringing back to their desk a new tool or skill that can take their professional life to the next level. I’ve experienced this myself – I needed to do some video editing for work, and took a course to learn it. But as the course continued, it started to cover advanced skills that I didn’t need at the moment. I didn’t finish the course, but I still learned the skills I needed to and I can always go back to learn more if I needed. If someone put my data into the category of “dropout” they would have an unrealistic view of how successful the course was for me (very!). I’m not alone – 33% of people who sign up for an online course have no intent to finish it entirely. So what can you do differently when providing training to your employees, understanding that their needs don’t always fit neatly into course offering? When I took that writing MOOC I mentioned earlier, I didn’t finish it. The MOOC was set up like an advanced college course. I love learning, and I wanted to engage as much as possible, but there were dozens of pages of weekly readings and hour-long lectures. Plus, the assignments were complex. The MOOC attempted to replicate classroom interaction by dumping thousands of students into a buzzing online discussion board. It was overwhelming. This might have worked if I was still a student, working part time. But now I’m an adult with lots of responsibilities and long work weeks. I would have liked to follow the material at my own pace, or maybe take the course during a less busy time at work, but the course was conducted live, crunched into six intensive weeks. For me, the course was unsuccessful because a classroom-style education no longer fit into my life. And those who have conducted MOOCs are discovering that many adult learners feel similarly. Elearning has a lot of flexibility in how it’s conducted – and training and development professionals need to use it. In short, completion rates have everything to do with the employee’s relationship to the material and how it fits into their lives. Creating courses that meet learner needs in terms of material and format will be sure to raise the engagement metrics, and course completion rates in non-required training should be considered a relatively unimportant measure of success. Adult professionals learn what they can, when they need it, and the online learning environment should reflect that. Want to audit your courses for quality? This checklist covers the basics of what a course should contain to engage learners, create a great user-experience, and retain teaching integrity. Previous articleSales Training Techniques That Can Apply to Any IndustryNext article What is Adaptive Learning?